I am writing on behalf of The Knightsbridge Association (the KA) to urge you, as the relevant Secretary of State, to ensure that the United Kingdom (UK) complies in full with air quality laws in the wider Knightsbridge area of London (and elsewhere throughout the UK). The KA is concerned about serious breaches of air quality laws in this part of London (and elsewhere). Local air pollution levels in 2008 were close to record levels. Annual mean levels of nitrogen dioxide (NO2) were well over twice the maximum level recommended by the World Health Organisation (WHO) and peak levels occurred some 427 times compared to the WHO’s maximum recommended frequency of 18 times. The KA estimates that annual average levels of particulate matter (PM10) in this area exceeded 40 micrograms per cubic metre (μg/m3) and may have approached 50 μg/m3. The WHO has stated that there is no safe level for exposure to particulate matter. This situation is clearly unsustainable and unacceptable. European Union (EU) air quality laws required annual average levels of PM10 air quality to attain 40 μg/m3 from 1 January 2005 and for that level not to be exceeded once attained. These laws were transposed into UK law in the Air Quality Standards Regulations 2007 (AQSR 2007). These Regulations impose inter alia a statutory duty on you, as the relevant Secretary of State, to develop action plans to improve air quality in the short term. This duty was reaffirmed and clarified recently in a preliminary Judgement by the European Court of Justice (ECJ). The KA is hereby notifying you that it respectfully requests and requires in respect of the wider Knightsbridge area that you as Secretary of State: (i) prepare and implement urgently an action plan that is capable of reducing to a minimum the risk that the limit values for NO2 and PM10 will be exceeded and of ensuring a gradual return to a level below those limit values; and (ii) at least maintain air quality (where limit values have already been met), and otherwise comply in full with relevant air quality laws. Please note that the requirement that limit values must not be exceeded once attained is an absolute legal requirement. The KA is concerned further that decisions may be taken by the Mayor of London and/or others during 2009 or subsequently which would adversely and illegally impact air quality in this area e.g. the possible removal or weakening of the western extension of the Congestion Charging Zone (the WEZ). In the KA’s carefully considered view, such a decision would inter alia worsen air quality where it has attained limit values for PM10 and thereby breach air quality laws unless at least directly offsetting measures were put in place simultaneously upon its removal. These measures might include dynamic road pricing (such as ‘tag and beacon’) and/or one or more inner Low Emission Zones (which will be needed anyway to ensure that air quality laws are complied with cost effectively). Please therefore issue ‘directions’ as necessary to the Mayor of London and/or others to ensure that relevant air quality laws are complied with fully. The KA hopes, if you respond positively and energetically to this letter in respect of the wider Knightsbridge area and/or London as a whole, that its actions may set a valuable precedent and encourage other community groups in London (and elsewhere) to seek improvements in local air quality and reductions in air pollution generally. As you know, in order to protect public health, legally binding limit values were due to be met for PM10 by January 2005 and are due to be met for NO2 by January 2010. From a legal perspective, the KA was particularly concerned therefore to see maps which show that the government still expects the peak/exceedances limit value for PM10 to be being breached in Brompton Road and Knightsbridge in 2011 i.e. even though this date is the final deadline for compliance with these limit values if the UK obtains a time extension for compliance (which it may not). This would be more than six years after these limit values were due to be attained. Furthermore, new air quality laws will require NO2 levels to be reduced by more than one-third in the next 12 months (even if the UK obtains a time extension beyond January 2010 which it may not). From a health perspective, in 2008, annual average NO2 air pollution in Marylebone Road, Kings Road and Brompton Road was well over double the WHO’s maximum recommended level with peak levels occurring between six and 24 times more often than the WHO’s maximum recommended frequency for an hour of exposure. Full details of these monitoring sites can be found on the excellent London Air Quality Network (LAQN) (http://www.londonair.org.uk). Clearly, such levels of air pollution are totally unacceptable. Air pollution in Brompton Road in 2008 was close to the highest levels recorded since regular monitoring began here. According to the LAQN, the annual mean level of NO2 in 2008 was 91 μg/m3 (compared to the highest recorded peak of 95 μg/m3 in 2006 and the lowest level of 83 μg/m3 when regular monitoring began in 2001). Hourly maximum recommended exposure levels for NO2 were exceeded on 427 occasions in 2008 (compared with the previous peak of 440 exceedances in 2007 and (again) the lowest recorded of 97 exceedances when monitoring began in 2001). These compare with WHO standards, backed by EU and UK laws, of 40 μg/m3 and 18 exceedances respectively. You will be aware that London has the highest annual mean level of NO2 of any capital city in western or eastern Europe. See: http://www.urbanaudit.org/rank.aspx. In order to estimate levels of PM10 in Brompton Road, the KA has compared monitored levels of NO2 and PM10 in Cromwell Road with monitored levels of NO2 in Brompton Road. BromptonRoad 93 ? 95 ? 94 ? 91 ? Two points are clear from these facts and this analysis. First, monitored levels of annual average and peak PM10 in Cromwell Road dropped below the limit values in 2007 and 2008 i.e. after the WEZ was introduced (in February 2007). Second, somewhere between the Natural History Museum and the north end of Sloane Street, annual average levels of PM10 attained the limit value for PM10 of 40 μg/m3 in 2008 before rising towards the north end of Sloane Street. Please note separately that the expected initial benefit from the current Low Emission Zone will have been reduced by the approach to enforcement. The government will surely accept therefore that both the annual average and peak limit values for PM10 were breached in 2008 at some point between the Natural History Museum and the north end of Sloane Street. There are two consequences of this fact. First, air quality laws are being broken in this area and second, air pollution must not exceed the limit values for PM10 where it has now been attained. The new EU directive on ambient air quality and cleaner air for Europe which entered into force on 11 June 2008 (the 2008 AQ Directive) states that ‘Directives 96/62/EC, 1999/30/EC, 2000/69/EC and 2002/3/EC shall be repealed as from 11 June 2010’. They will be replaced simultaneously then by similar provisions. These Regulations give you as the relevant Secretary of the State many duties and powers to improve air quality. The KA wishes to bring to your attention, inter alia, five of these duties/powers at this time. Article 2(1) of the Framework Directive defines ‘ambient air’ as meaning outdoor air in the troposphere, excluding work places. Article 6(1) states ‘Once limit values and alert thresholds have been set, ambient air quality shall be assessed throughout the territory of the Member States in accordance with this article’. The Explanatory Memorandum states for Article 6(1) of the Framework Directive that ‘The transposition of this Article is set out in detail below. It has to be read together with Article 7 of Directive 1999/30EC and Article 5 of Directive 2000/69/EC’. The AQSR 2007 set out, in Regulation 13 and elsewhere, how ambient air quality is to be measured. In the KA’s considered view, limit values apply in ambient air throughout the UK, excluding work places, and must not be exceeded once attained. Article 2(5) of the Framework Directive defines a ‘limit value’ as a level to be attained within a given period and not to be exceeded once attained. The limit values for PM10 were due to be attained by January 2005 and those for NO2 are due to be attained by January 2010. The Explanatory Memorandum confirms that Articles 7(1) and 7(3) were transposed into Regulations 7(1) and 11 respectively of the AQSR 2007. Regulation 7(1) of the AQSR 2007 makes clear that ‘The Secretary of State shall take the necessary measures to ensure that the air quality standards … are attained’. Regulation 11 of the AQSR 2007 states that ‘The Secretary of State shall prepare and implement action plans’ and that ‘when he considers that [there is a the risk that a limit value will be exceeded] within a zone, he shall implement the measures indicated in the relevant action plans within that zone to the extent that he considers necessary in the circumstances’. In the KA’s considered view, limit values apply in ambient air throughout the UK, excluding work places, and must not be exceeded once attained. Furthermore, a recent preliminary ruling by the ECJ (referred to later in this letter) has confirmed the right of citizens to require that an action be implemented in the short term i.e. not a short time after (a long) time has been taken to prepare plans. The Explanatory Memorandum states that Article 2 of the Framework Directive was transposed into Regulation 2 of the AQSR 2007. However, the definition in Regulation 2 of the AQSR 2007 refers only to ‘limit values’ being a maximum concentration. In the KA’s considered view, the government has transposed inadequately the definition of limit values by restricting the definition. Nevertheless, in the KA’s considered view, limit values apply in ambient air throughout the UK, excluding work places, and must not be exceeded once attained. The Explanatory Memorandum stated on page 11 that ‘regulations rely on public law remedies in relation to breach by the Secretary of State. Penalties in relation to specific polluters are set out in applicable sectoral legislation’. Question: Please explain where the penalties referred to above have been transposed into national law and/or are otherwise in effect and explain why you consider them to be effective, proportionate and dissuasive. Regulation 30 of the AQSR gives the Secretary of State ‘the same power to give directions under these Regulations to: local authorities in Greater London; and the Mayor of London, as the Secretary of State has under section 85(5)(a) of the Environment Act 1995 in relation to local authorities outside Greater London’. Section 85(5)(a) of the Environment Act 1995 states that ‘The Secretary of State shall also have power to give directions to local authorities requiring them to take such steps specified in the directions as he considers appropriate for the implementation of any obligations of the United Kingdom under the Community Treaties … so far as relating to the quality of air’. the power to give directions to the Mayor of London and/or local authorities in London to meet any such obligation. The KA respectfully requests and requires that you, as Secretary of State, fulfil these two statutory duties fully including, if necessary, through the giving of directions to the Mayor of London and/or others to ensure that the limit values for NO2 and PM10 are attained in the wider Knightsbridge area and are not exceeded once attained. You are likely to be aware of the important Judgement of the European Court of Justice in Case C-237/07: Dieter Janacek v Freistaat Bayern. Press release no. 58/08 dated 25 July 2008 made clear that ‘Where there is a risk that the limit value for particulate matter may be exceeded, persons directly concerned can require the competent authorities to draw up an action plan’. The European Commission has welcomed the preliminary ruling and the recognition by the ECJ that individual citizens have the right under the Framework Directive to require national authorities to draw up a short term action plan with the aim of maintaining or achieving compliance with the air quality limit values. It is clear from the Judgement that citizens are entitled to require that action plans are prepared and implemented to improve air quality in the short term i.e. not a short term after a long time has been taken to prepare such plans. You may be aware that Commissioner Dimas confirmed in his letter dated 16 December 2008 to Edward Davey, Shadow Foreign Secretary of the Liberal Democrats, that the European Commission is preparing the launch of infringement proceedings against the UK for exceeding the PM10 limit values. Significantly, Commissioner Dimas, the Environment Commissioner, referred to this Judgement in his letter to Edward Davey when he said: “The Commission welcomed this ruling in which the Court confirmed that EU citizens concerned by air pollution have the right to require before national courts, not only that air quality limit values are complied with, but also that local authorities draw up air quality action plans when there is a risk that limit values set under EU legislation are exceeded. It is expected that this ruling will provide a further incentive at all levels of governance to take appropriate measures to comply with air quality legislation”. The KA is hereby respectfully exercising its right to request and require you, as the competent authority as defined in the AQSR 2007 and as confirmed by the Judgement referred to above, to ensure that the limit values for NO2 and PM10 are attained in the wider Knightsbridge area of London and not exceeded once attained. 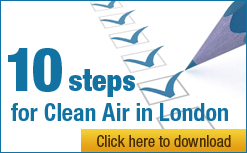 Please take such action as may be necessary including, but not limited to, giving appropriate directions to the Mayor of London and/others to ensure that limit values will not be exceeded once attained and to implement action plans that are expected to achieve, in the short term, the limit values for NO2 and PM10. Indeed, the previous Air Quality Minister, Jonathan Shaw, highlighted this matter in the House of Commons on 17 July 2008 when he expressed concern about ‘what life would be like without the congestion charge in [the western extension of the zone (the WEZ)’. This debate can be seen at: http://www.theyworkforyou.com/debate/?id=2008-07-17a.388.6. This announcement took place despite the KA highlighting to Mayor Johnson, in its reply to the informal consultation that took place in September 2008, that it considered that such action could breach the Mayor’s statutory duty to work towards the limit values and the Secretary of State’s duty to ensure limit values are not exceeded once attained. As you will have seen at the start of this letter, the limit values for PM10 have only recently been met in part of the wider Knightsbridge area after coming into force in 2005. As set out above, you are under a legal duty to ensure that the limit values are not exceeded once attained. In the KA’s view therefore, if you allow the removal or weakening of the WEZ, without its replacement simultaneously by fully offsetting measures to improve local air quality, this would represent a breach of your statutory duty to ensure that limit values are not exceeded once attained. As an aside, one possible inadvertent consequence of the WEZ being removed is that proposals to improve the Exhibition Road area could be jeopardised since they may divert traffic to already over-burdened roads. Please therefore direct Mayor Johnson and/or others as necessary not to remove and/or weaken the WEZ unless at least full, directly offsetting measures are put in place simultaneously to improve local air quality in this area. The purpose of this letter is not to propose particular measures to improve air quality (that have been referred to in detail in other correspondence). Indeed, it is clear from the AQSR 2007 and other air quality laws that you have a duty to consider a variety of possible measures. However, the KA wishes to bring to your particular attention the merits of implementing one or more additional inner Low Emission Zones (LEZs) in London. Second, to achieve economies of scale, these LEZs should be backed by national standards and incentives for the abatement of hazardous emissions from vehicles. Fifth, the introduction of such an inner LEZ may make it possible not to tighten further the existing LEZ i.e. avoid the necessity for the oft referred to ‘white van man’ (and others) to drive lower emission vehicles into parts (say) of outer London which do not face an air quality problem. The KA wishes to record its thanks to you for your personal commitment to see air quality improved and for all the work that you and your many colleagues at Defra undertake in this area. We have copied a number of interested parties, not least the current Air Quality Minister, Lord Hunt of Kings Heath. Finally, the KA wishes to emphasise its hope that its actions may set a valuable precedent and encourage other community groups in London (and elsewhere) to seek improvements in local air quality and reductions in air pollution generally. Please acknowledge receipt of this letter and respond then on behalf of the government to the points made in this letter. In doing so, please reply electronically to the email address provided separately.